← evo’s populist government fails one more time! The opposition senator Arturo Murillo announced yesterday that he will denounce the seven members of the Supreme Electoral Tribunal (TSE), before the full court, because they did not comply with the principle of impartiality when holding secret meetings with President Evo Morales. 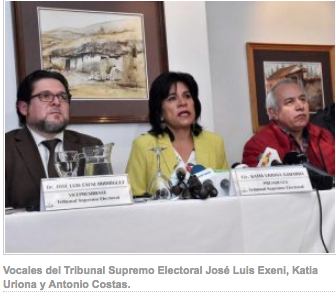 The legislator is sure that the electoral authorities committed administrative indiscipline, so yesterday afternoon he sent the TSE a memorial requesting a trial against Katya Uriona, Dunya Sandoval, José Luis Exeni, Antonio Costas, Lucy Cruz, María Eugenia Choque Idelfonso Mamani: The legal figures would be for serious and very serious faults. He explained that the Political Constitution of the State (CPE) and the Plurinational Constitutional Judgment SCP 0686/2012 mention the separation of powers as an organizing principle in our State that is a fundamental quality that characterizes democracy. This entry was posted in Bolivia, Politics, Social Unrest and tagged bad politics, corruption in public office, democracy in peril. Bookmark the permalink.